I had a chance to teach children what a sound artist and a sound designer does. 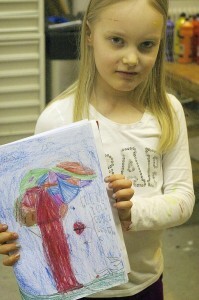 I met up with two groups of children in Annantalo Arts Center. A group of 5 to 6 year olds and a group of 7 to 9 year olds. They had seen my installation at the Arts Center earlier that week. We talked about my sound installation with the wood that are playing sounds of the forest. The children had made some drawings about it. Here are couple of the sound trees by Iida and Johannes. They are both 6 years old. 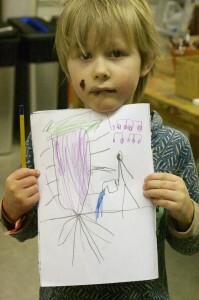 Iida, 6, with a sound tree. Johannes, 6, with a sound stomp. With the children we figured out what a sound artist and a sound designer does. I introduced my sound recording gear to the children and I also let them to hear with headphones and through the microphones how it sounds like to record sounds.